The Code for Independent Directors contained in The Companies Act, 2013 provides that we should issue a letter of appointment to the Independent Directors. 1. 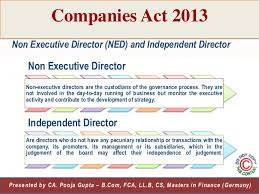 Your appointment as a Non-Executive Independent Director on the Board of Directors of the Company is subject to the provisions of the Companies Act, 2013. 2. In compliance with provisions of section 149(13) of the Companies Act, 2013, your directorship is not subject to retirement by rotation. 3. Notwithstanding other provisions of this letter, the appointment may be terminated in accordance with the provisions of the Articles of Association of the Company or on failure to meet the parameters of independence as defined in section 149(6) or on the occurrence of any event as defined in section 167 of the Companies Act, 2013. 4. Upon termination or upon your resignation for any reason, duly intimated to the Company, you will not be entitled to any compensation for loss of office. 5. 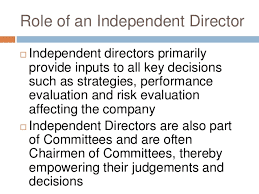 As a Non-Executive Independent Director you are expected to bring objectivity and independence of view to the Board's discussions and to help provide the Board with effective leadership in relation to the Company's strategy, performance, and risk management as well as ensuring high standards of financial probity and corporate governance. The Board generally meets four times in a year. The Audit Committee generally meets atleast four times in a year. Besides, there are other Committee meetings like Nomination and Remuneration Committee, Corporate Social Responsibility Committee, Stakeholder Relationship Committee, Finance Committee etc. meetings of which are ordinarily convened as per requirements. You will be expected to attend Board and Board Committees to which you may be appointed and Shareholders meetings and to devote such time to your duties, as appropriate for you to discharge your duties effectively. Ordinarily, all meetings are held in -----except the Annual General Meeting. 6. By accepting this appointment, you confirm that you are able to allocate sufficient time to meet the expectations from your role to the satisfaction of the Board. I. You shall act in accordance with the Company's Articles of Association as may be amended from time to time. II. You shall act in good faith in order to promote the objects of the Company for the benefit of its members as a whole, and in the best interest of the Company. III. You shall discharge your duties with due and reasonable care, skill and diligence. IV. You shall not involve yourself in a situation in which you may have a direct or indirect interest that conflicts, or possibly may conflict, with the interest of the Company. V. You shall not achieve or attempt to achieve any undue gain or advantage either to yourself or to your relatives, partners or associates. VI. You shall not assign your office as Director and any assignments so made shall be void. i. You should constructively challenge and help develop proposals on strategy for growth of the Company. II. You should evaluate the performance of management in meeting agreed goals and objectives. III. You should satisfy yourself on the integrity of financial information and that financial controls and systems of risk management are effective and defensible. IV. You are responsible for determining appropriate levels of remuneration of Executive Directors and have a prime role in appointing, and where necessary, removing Executive Directors and in succession planning. V. You will take responsibility for the processes for accurately reporting on performance and the financial position of the Company. VI. You should keep governance and compliance with the applicable legislation and regulations under review and the conformity of Company's practices to accepted norms. 8. You will not be an employee of the Company and this letter shall not constitute a contract of employment. You will be paid such remuneration by way of sitting fees for meetings of the Board and its Committees as may be decided by the Board. Further, you will also be paid remuneration by way of commission as may be approved by the Board and the Shareholders from time to time. 10. You will have no entitlement to any bonus during the appointment and no entitlement to participate in any employee stock option scheme operated by the Company or any Group Company. 11. In addition to the remuneration described above, the Company will, for the period of your appointment, reimburse you for travel, hotel and other incidental expenses incurred by you in the performance of your role and duties. 12. There may be occasions when you consider that you need professional advice in furtherance of your duties as a Director and it will be appropriate for you to consult independent advisers at the Company's expense. The Company will reimburse full cost of expenditure incurred in accordance with the Company's policy. 13. The Company proposes to take Directors' and Officers' liability insurance and it is intended that the Company will assume and maintain such cover for the full term of your appointment. 14. It is accepted and acknowledged that you may have business interests other than those of the Company. As a condition to your appointment, you are required to declare any such directorships, appointments and interests to the Board in writing in the prescribed form at the time of your appointment. 15. In the event that your circumstances seem likely to change and might give rise to a conflict of interest or, when applicable, circumstances that might lead the Board to revise its judgement that you are independent, this should be disclosed to both the Chairman and the Company Secretary. 16. The Board of Directors will carry out an evaluation of the performance of the Board as a whole, Board Committees and Directors on an annual basis as per Company's Policy. Your appointment and reappointment on the Board shall be subject to the outcome of the yearly evaluation process. 17. Any material interest that a Director may have in any transaction or arrangement that the Company has entered into should be disclosed no later than when the transaction or arrangement comes up at a Board meeting so that the minutes may record your interest appropriately and our records are updated. A general notice that you are interested in any contract with a particular person, firm or company is acceptable. 18. During the appointment you are required to comply with regulations as contained in Schedule IV under Companies Act, 2013, including the Code of Conduct. 19. All information acquired during your appointment is confidential to the Company and should not be released, either during your appointment or following termination (by whatever means) to third parties without prior clearance from the Chairman unless required by law or by the rules of any stock exchange or regulatory body. On reasonable request, you shall surrender any documents and other materials made available to you by the Company. 20. Your attention is also drawn to the requirements under the applicable regulations and the Company's Insider Trading Code which concern the disclosure of price sensitive information and dealing in the securities of the Company. Consequently you should avoid making any statements or performing any transactions that might risk a breach of these requirements without prior clearance from the Chairman or the Company Secretary. 21. In line with provision of Clause IV sub clause 6 of Schedule IV, under Companies Act, 2013, the Company will make public the terms and conditions of your appointment and will also arrange for it to be displayed on the Company's website. 22. The Board of Directors may appoint you as Member I Chairman of one or more of its Committees which will be covered in a separate communication setting out the relevant committee's terms of reference and any specific responsibilities. 23. You may resign from your position at any time and should you wish to do so, you are requested to serve a reasonable written notice on the Board. In terms of provisions of the Companies Act, 2013, you are required to file a copy of your resignation letter with the Registrar of Companies, Mumbai. 24. Continuation of your appointment is contingent on your getting re-elected by the shareholders in accordance with provisions of Companies Act, 2013 and the Articles of Association of the Company, from time to time in force. You will not be entitled to compensation if the shareholders do not re-elect you at any time. 25. Your appointment may also be terminated in accordance with the provisions of the Articles of Association of the Company from time to time in force. 26. This Letter and any non-contractual obligations arising out of or in connection with this Letter are governed by, and shall be construed in accordance with, the laws of India, and the parties agree to submit to the exclusive jurisdiction of the courts of --------. 27. Please confirm your agreement to the above by signing and returning the enclosed duplicate of this Letter. I have read and agree to the above terms regarding my appointment as an Independent Director of --------------Limited. IS MANDATORY TO PAY SITTING FEES TO INDENPENDENT DIRECTOR ? It is not mandatory to pay sitting fees to the Independent director and if the company do not want to pay any remuneration to independent director ,it is better to pass a board resolution and get the approval of the same in members' meeting. Though the section 197(5) nowhere placed reliance that it must be mandatorily paid. It’s the mutual understating/terms between company and that (Independent Director) ID whilst the right of receiving of fee for meeting or commission, if any, may be waived off approving the same in meeting of shareholder and accordingly the same can be captured in the clause of remuneration of appointment letter. Make sure your company must receive written consent of that ID stating his right to waive off the same. 1.1 Mr. X shall not be paid remuneration by way of sitting fees for meetings of the Board and its Committees and remuneration by way of commission as decided by the Board dated.............. and approved by the the Shareholders in their meeting convened on........ Further, Mr. X will have no entitlement to any bonus during the appointment and no entitlement to participate in any employee stock option scheme announced by the Company or any Group Company.